The first House of Representative Meeting will take place on THURSDAY, SEPTEMBER 6TH at 11 AM in the VULCAN THEATER. ALL allocated clubs are required to send a representative. The representative MUST be on the Club/Organization Info. sheet on file at SAI. Failure to send a verified representative will result in a 10% penalty. Please remember to bring you Cal Card to swipe in. THURSDAY, SEPTEMBER 13th the Club and Organization Fair will be held outside on third street with a rain location of inside the Convocation Center. The Fair runs from 11am-12:30pm and all allocated clubs are required to attend or a 5% penalty is assessed. Clubs must have a table set up with some sort of display by 10:45am. Allocated clubs must complete their Redistribution Form prior to spending any allocated money. The form is available to complete with in OrgSync. 04-02-2018: 2018 Homecoming Float Packet Available! Go to: https://orgsync.com/58722/files/1435858/show to download the packet. Reminder that budget submissions for 2015-2016 are due tomorrow (Wednesday, February 24th) by midnight. Attention all allocated clubs and organizations. As of this afternoon 100% of your allocation award has been entered into your account. Previously SAI was withholding 25%. There will be no House of Representatives Meeting the month of December, which would have been tomorrow 12-3-15. Due to the Thanksgiving Holiday SAI will not be cutting checks next week. All paperwork turned in between now and Tuesday December 1st prior to 2pm will be ready on December 4th. Online orders, travel, purchase orders, and credit card sign outs will continue as normal. Thank you and have a safe and happy Thanksgiving. Did you know that every Cal U student has access to a list of all their out-of-classroom experiences and activities in the form of an official Cal U Activities Transcript? This free document can be requested for scholarship applications, for help when writing a resume, or to share with grad schools or potential employers. 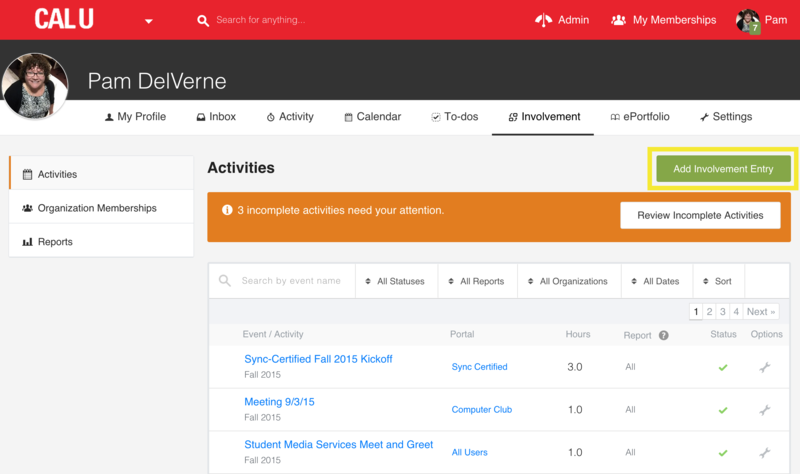 Your Activities Transcript is located in your profile, at the Involvement link. Click on your profile image, then click on Involvement in the black user drawer. Once you have navigated to your personal Involvement page, you can view your current involvement entries, add new entries, review incomplete activities, request copies of your involvement report and more. If you are a member of a club, and you are on their roster on their OrgSync portal, your membership will automatically be added to your transcript. If your club isn't using OrgSync to its fullest potential, you may need to add your membership manually. You can do this by clicking on the green Add Involvement Entry button. Pro tip: In OrgSync, green buttons are action buttons that create content. You may be required to complete a survey or other form before you can receive credit for an activity. You can review them by clicking on Review Incomplete Activities in the orange Alert box. They all require the same basic information: the organization/service partner, start and end dates, and reference name and email. Optional information is the reference's title/position/phone number, proof of participation, learning outcomes, and reflection. Pro tip: Even though Proof of Participation isn't required, it's highly recommended that you upload a PDF of a thank-you email, certificate, or other proof so your entry can be approved in a timely manner. Official copies of your Activities Transcript are free of charge and can be requested whenever you need a copy. You can request a digital copy (which is delivered as a PDF to your Cal U email) or a paper copy (which is delivered via USPS to the address you enter when you make the request). Both official and unofficial copies can be generated at any time from the Reports page, which can be accessed by clicking on Reports in the left-side menu. To request your Activities Transcript, go to the Reports page, then locate the Co-curricular Record section. For an official copy, click on Request Official Transcript. For an unofficial copy, click on Export PDF. Pro tip: Don't request a copy of your transcript until ALL your pending entries are approved! 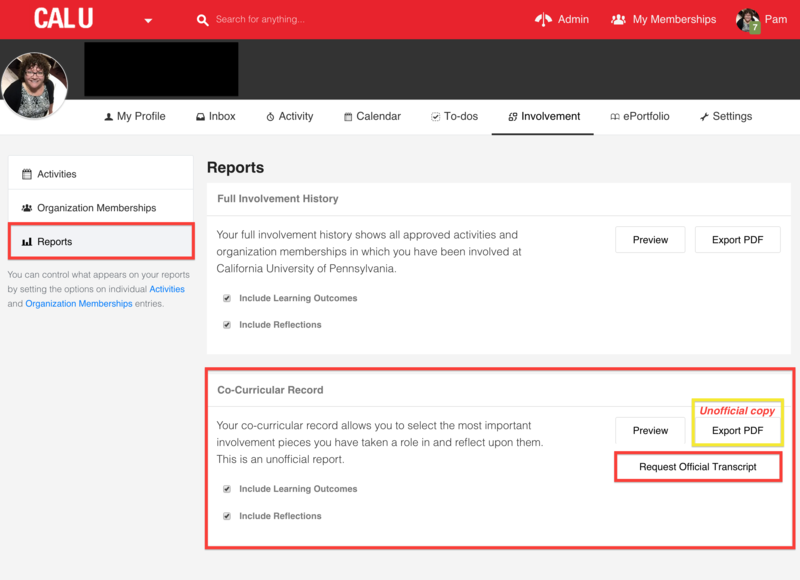 Pro tip: If you want to see your Learning Outcomes on your transcript, you need to export your Full Involvement History instead of the Co-Curricular Record. If you have additional questions about adding or changing entries on your Activities Transcript, contact Pam DelVerne at delverne@calu.edu. Due to the Thanksgiving Holiday paperwork for checks will need to be turned in no later than 10 am on Tuesday, November, 25. This will guarantee you a check for Wednesday, November, 26. The monthly House of Representatives meeting will NOT take place in the Vulcan Theater on Thursday, November 6th. Your club’s attendance will be counted if you send your President or designee to the Campus Talk with President Jones at 11 am in the South Wing of the Convocation Center. Your CalCards will be swiped at the door. If your club’s President or designee does not swipe in at the event, your club will be issue a 5% allocation penalty. The Proposed Allocated Budget for 2014/2015 will be published in the Cal Times this Friday, April 4th. On Monday April 14th, the budget will presented during the SAI Annual Corporation Meeting at 4:15 pm in the Performance Center and will be voted upon by all eligible members of the SAI Corporation. There are a number of scholarships that are available for student leaders and PSECU members. Each scholarship has its own requirements, so please read through the details before applying. All of the scholarships below can be applied for via OrgSync! Deadline: March 28 at 4:00 p.m.
A copy of the student’s activity transcript. Deadline: April 18 at 4:00 p.m. Consideration for this scholarship shall be given to full-time undergraduate students enrolled at the University who have achieved positive academic records (2.5 GPA or better). Students will be selected based on theirleadership or potential for leadership through participation in any recognized club of the Student Association, Incorporated. Deadline: April 3, 2014 at 3:00 p.m. Applications are now being accepted for 14-15 PSECU - Student Activity Scholarships. These scholarships are available to undergraduate and graduate students. 03-14-2014: Schedule Yearbook Photos Now! Please fill out the form as soon as possible; we need to schedule your date well before the end of the semester. The votes have been cast and our winning theme is SPIRIT OF AMERICA! Time to start thinking of float and banner ideas! And, if you're a creative sort, we need your submission(s) for our logo contest. The Homecoming Committee is accepting submissions of logo ideas from students for the Homecoming festivities to be held the week of October 5-11, 2014. This year’s theme is SPIRIT OF AMERICA. The logo will be used on all Homecoming materials, including posters, post cards, website, t-shirts and other promotional items. The ideal logo will be flexible enough to use in portrait or landscape layouts, and be effective in either full-color or black & white. Last year’s winner was Laura Shirley, a former Graphic Design student-now Cal U alumna, from Downingtown. Please read the rules of the contest below carefully before submitting your logo. Must be related to this year’s theme of SPIRIT OF AMERICA. Must include the Cal U logo, or the words California University of PA or Cal U of PA or Cal U, AND 2014. Logo must be submitted as a vector graphic in AI, EPS or PDF format with all additional images embedded and fonts outlined. Entry must be submitted online via the submission form on OrgSync (https://orgsync.com/58722/forms/100887) by Friday, April 25, at 4:00 p.m.
One winner will be selected by popular vote. The winner will be determined by whichever design has the most votes on OrgSync from Monday, April 28 until Friday, May 2. The winner will be announced Monday, May 5. A mandatory House of Reps meeting is scheduled for Thursday December 5, 2013 at 11:00 am in the Vulcan Theatre. All allocated clubs must send at least one representative and a person may only represent one club not multiples. There will be a CalCard swipe and sign-in sheet. Representatives should arrive on time and plan to stay for the entire meeting to receive credit. 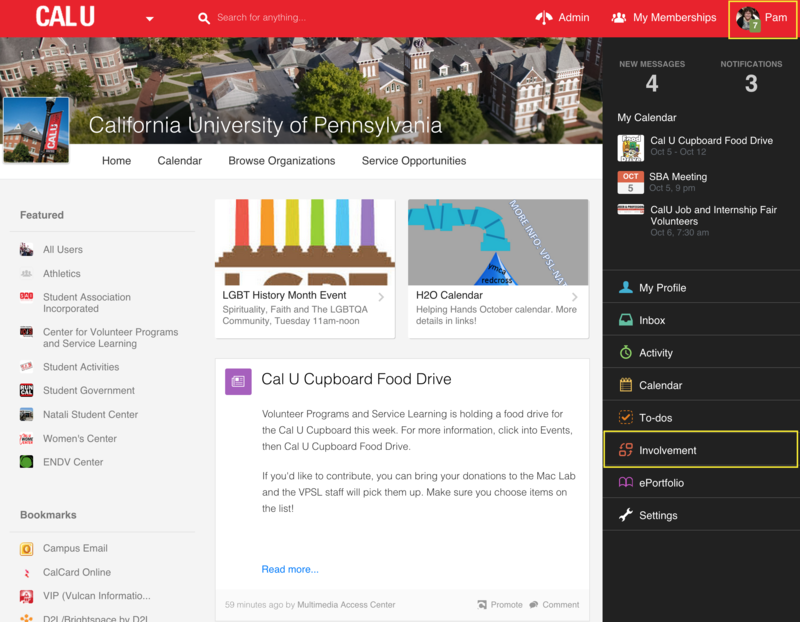 You can now link to your group's social media accounts right on the front page of your portal! If you're an admin, look for the Social Media section on the right side of your page, under Upcoming Events. Just click on the Add LInks button to add your accounts. You can add Twitter, Facebook, Google+, Pinterest, Youtube, Instagram, and Tumblr. Once added, icons will appear that will link to your accounts.